A chiastic outline of the book of Revelation was proposed by Nils Wilhelm Lund, in 1942. Reviews of his book viewed Lund’s claims as too revolutionary. The above quote is from http://www.conservapedia.com/Chiasmus. The seer tends to develop his material concentrically into ever-widening rings. So, for example, several of the eschatological promises to those who conquer (the victorious)–an element of the seven letters of chapters 2-3–reappear in the vision of the New Jerusalem in chapters 21-22: at the beginning of the vision of renewal God makes the link to the letters by saying, “He who conquers shall have…” (21:7, cf. 2:11); the tree of life promised to those victorious at Ephesus (2:7) appears in the city (22:2); The victorious at Smyrna will not be harmed by the second death (2:11), a phrase that is made clear in 21:8 (cf. 20:6, 14); those conquering at Sardis will not have their names wiped from the book of life (3:5, cf. 21:27); and to those conquering at Laodicea Jesus promises a seat with him on his throne (3:21), while at 22:5 his servants reign forever in the city with the enthroned God and the royal Lamb. Snyder’s scheme, IMO, misses evidence for chiasm in chapter 12. 2. L.L. Thompson, The Book of Revelation (New York:Oxford University Press, 1990) p. 45. 3. Elisabeth S. Fiorenza. Revelation: Vision of a Just World. Fortress Press, 1998. p. 35-36. 4. Warren Austin Gage, St John’s vision of the heavenly city. p. 26. 6. G. K. Beale. The Book of Revelation: A Commentary on the Greek Text. New International Greek Testament Commentary. Wm. B. Eerdmans Publishing Company. 1998. p. 143. Is Revelation 12 a chiasmus? Is the first Chaism suggested in this article your own or is there a reference for it. Just wondering. Yes, it is my own. 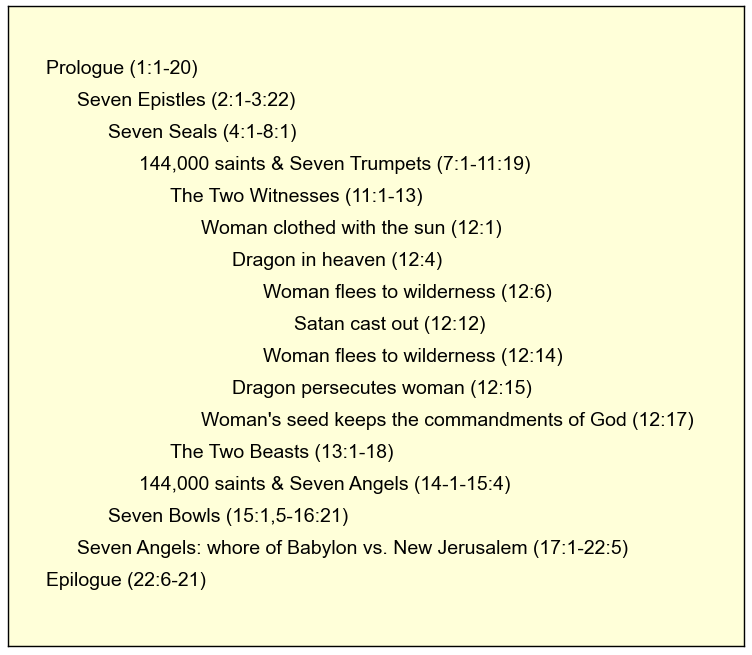 The following is a large chiastic structure showing the similarities between the book of Genesis and the book of Revelation. Note the cluster where Naamah’s name is mentioned. Also, the chiasmus fades as it moves toward the center. let them be for lights in the firmament of the heavens to give light on the earth”; and it was so. Then God made two great lights: the greater light to rule the day, and the lesser light to rule the night. There shall be no night there: They need no lamp nor light of the sun, for the Lord God gives them light. And the gold of that land is good. Bdellium and the onyx stone are there. Then the rib which the LORD God had taken from man He made into a woman, and He brought her to the man. He laid hold of the dragon, that serpent of old, who is the Devil and Satan……so that he should deceive the nations no more till the thousand years were finished. And Adam called his wife’s name Eve, because she was the mother of all living. Also for Adam and his wife the LORD God made tunics of skin, and clothed them. And he built a city, and called the name of the city after the name of his son, Enoch…etc…Jubal. He was the father of all those who play the harp and flute. 22 And as for Zillah, she also bore Tubal-Cain, an instructor of every craftsman in bronze and iron. And the sister of Tubal-Cain was Naamah. Then Lamech said to his wives: “Adah and Zillah, hear my voice, Wives of Lamech, listen to my speech! For I have killed a man for wounding me, even a young man for hurting me. “Come into the ark, you and all your household, because I have seen that you are righteous before Me in this generation. “Come out of her, my people, lest you share in her sins, and lest you receive of her plagues. For her sins have reached to heaven, and God has remembered her iniquities. The seven heads are seven mountains on which the woman sits……the waters which you saw, where the harlot sits, are peoples, multitudes, nations, and tongues. I saw the woman, drunk with the blood of the saints and with the blood of the martyrs of Jesus. Behold, I am coming as a thief. Blessed is he who watches, and keeps his garments, lest he walk naked and they see his shame. David, the Chiasm below is a modification of the one you suggested. I’m surprised you have left out one of the most significant features of chiastic structure in Scripture, as discovered by the Orthodox priest and scholar Fr. John Breck in his book ‘The Shape of Biblical Language’ – that the center of the chiastic structure is the point or purpose of the entire thesis! Pick up a copy and carry your understanding even further. I used some of your material to teach my students about the book of revelation. At the end of the class when they seemed to get it, we decided to writ sour own. I think it’s a really good one. And out of bed we spring. Have no fear, The Lord is near! The Spirit whispers in our ear. We can do this all year. If someone could figure out how Rev. 11:15-19 fits with Genesis I would appreciate it.